The Knicks season finally ended last night and things could not be more dire. The product on the court stinks and does not understand however to become good again in the current NBA. Things are even more bad in the front office with Management having no clue what direction the team is currently heading in. The Knicks beat the Philadelphia 76ers Wednesday night, much to the dismay of Knicks’ fan everywhere. For the last couple of weeks, fans wanted the Knickerbockers to lose to get a better draft pick. The Knicks always seem to want to do things that are completely opposite of what fans wanted them to do. They blew any chance they had of getting the top pick in the draft. They straight up stunk this season. The win against the Sixers ended a dismal season for the Worst Show on Broadway. The veterans on the team had given up on this season before presents ever even put under the tree for Christmas. There are some young players on the team that did not progress as we would have liked. Gonzingis did not progress and missed games due to injuries multiple times this season. The team looked like it had a true cornerstone in Porzingis coming into this season but that might not be the case when it is all set and done. The Porzingis not approving situation might be a big deal on other teams, but it is certainly not the biggest issue with the Knicks. Their biggest issue on the court goes by the name of Carmelo Anthony, you might have heard of him. Melo, as likes to call himself, had a decent season but is hurting the long term future of the team. Melo should be traded by the Knicks to a team that is ready to win a championship right now, but Melo wants to stick it to the front office. Melo is one of three players in the NBA that has a full No-Trade clause, I have no idea why the Knicks were dumb enough to give him this leverage point, but more on that later. It looks like Melo is willing to go to only a handful of teams, that might not have great returns for the Knicks. The Knicks had a lackluster performance on the court this season. The coaching is not being criticized because there are so many issues with this team. Now lets look at how things are going off the court. The Knicks owner James Dolan, reportedly has picked up Phil Jackson’s two year option for reasons that even God cannot come up with. Phil Jackson has been awful at his job and should have been fired by Dolan. Jackson is rarely in New York or on college campuses scouting players for the Knicks. Jackson also does not speak to the media about what exactly is his master plan to solve the Knicks’ misery. He is scheduled to have a press conference on Friday afternoon but will not tell the media assembled for that press conference, anything that Knicks’ fan want to hear. The front office is in disarray, they are resigning people that should actually be fired. Couple of weeks ago, I outlined some of the things that the Knicks should have done to solve some of their problems. They obviously are not the 1 reader that reads all of my blogs, and have basically done everything opposite of what they should have done. 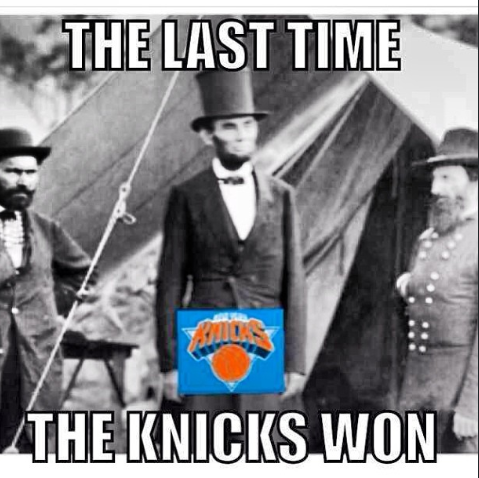 I have come to accept the fact that the Knicks are never going to be good in my lifetime. I will be fully diverting my attention to the other team in the Garden, who actually is a pretty good team. Lets Go Rangers!!! Plan the Parade!!! UPDATE: Phil Jackson spoke to the media on Friday afternoon and made some interesting comments. Jackson said that he believes Melo should go elsewhere. He is definitely reading my blogs, SUP Phil? Other than that he just said stuff to please some ears definitely not that of Knicks’ fans. The Knicks stink, so does the number of followers on the various social media accounts of this blog. Unlike the Knicks, the followers issue is actually solvable, and you can help me out in that solution by hitting that Like and Follow buttons.